Like most villages in the Abu Road region of Rajasthan, India, Nichlagarh is a predominantly adivasi village. Consisting of about 650 households in five hamlets, the village is spread over an undulating hilly, forested terrain, with streams, water check dams (nadis) and patches of mixed deciduous forests. Most women work hard on their fields or foraging from the forest to meet the needs of their households, while men work on their small tracts of agricultural land or work outside the village or on others’ fields. The women regard the forests as their domain and their culture, and their lives are intricately woven into the weft and warp of their forest commons. It was the adivasi women who drew attention to the region in 2010 when they took the initiative to organize a Dharna, or nonviolent mass sit-in strike, and blocked traffic on the highway. They were demanding recognition of their rights to the forest. Sharmi Bai, 45, is the dynamic president of the panchayat, or village council, whose leadership in mobilizing the community has twice earned her victory in the local election by large margins. Before the 1960s, the villages enjoyed free access to the forest and its grazing lands, but those lands have become increasingly restricted since the Forest Department took control; and in 1981 with the advent of the Forest Conservation Act, its control by the Forest Department was complete. Today women lament the loss of their autonomy and the decline in the health of the forests. 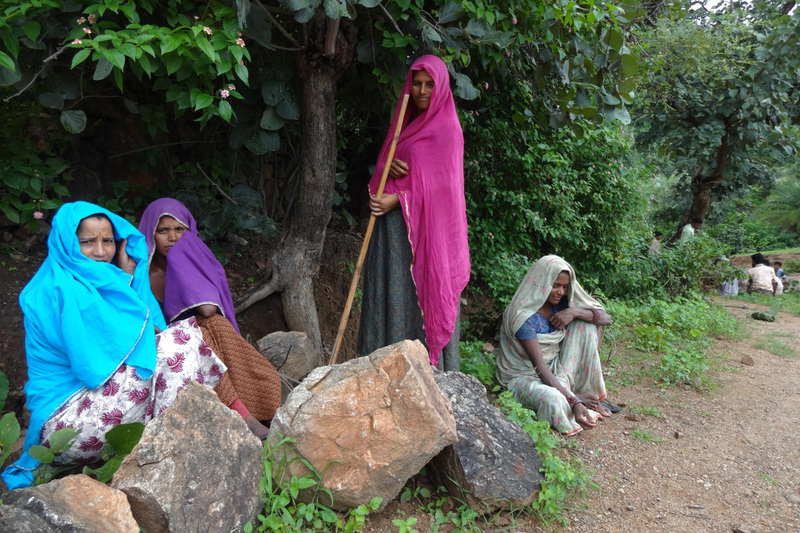 “If they [the Forest Department] had given us [women and adivasi people] community rights earlier, the forest would not have disappeared,” said women of the hamlet located closest to the forest commons, who witness its devastation every day. Despite their significant roles in managing forest commons, women were not allowed to participate in the traditional spaces where customary rights were determined. Given the patriarchal social structure of these tribes, women are not viewed as rights holders. Yet communities have recognized their roles and rely on them to advocate for rights and meet survival needs. The Forest Rights Act of 2006 (FRA) ushered in a major set of changes to create legal entitlements to traditional rights for forest dweller communities. The enactment sought to correct the “historical injustices” wrought upon the traditional forest dwellers. But the FD viewed the forest as its fiefdom and sought to govern it using modern principles of forest management, which focused on only a few species and failed to recognize traditional methods of sustaining forests and traditional forest livelihoods. The FD in its colonial legacy viewed forest dwellers and dependent com­munities as encroachers. It sought to curtail their rights or evict them from their forests through varied legislative and executive means, often causing serious risk to life and livelihoods. More recently, the FD had on the one hand come down heavily on communities to penalize them for encroachments and “illegal felling,” while itself allowing timber felling and extraction. It also al­lowed the allotment of forest lands to industries after only cursory community consultations, causing great distress and displacement of tribal communities in several regions. The Forest Rights Act challenged the FD’s control over the forests by expressly restoring traditional rights of forest dwellers to govern their forests through both individual claims and community rights. However, the FD, flout­ing the clear intent of the Act to give tribal communities autonomy in governing their forests, continues to resist this law by allowing recognition to only a small portion of the claims filed and challenging claims for community forests under the provisions of the FRA. The Forest Rights Act and the PESA Act (Panchayats Extension to Scheduled Areas) make provisions for communities to claim traditional rights for defining the extent and governance of the commons, validating their traditional systems and practices; these two laws seek to restore the autonomy of tribal communities to determine how their forests should be governed, and restrict the powers of the FD, which has resisted the implementation of these enactments. The recognition of women as key and legitimate actors in the democratic, decen­tralized forest governance of traditional tribal forums, has strengthened their roles. It has also strengthened the commoning process, enhanced livelihoods, and strengthened the region’s food security and environmental sustainability for future generations. Especially between 1980 and 2005, villagers routinely found large amounts of wood being pilfered from the forest, even after reporting such theft. “The powerful contractor lobbies try to get our young boys to steal the wood for their profit,” said Dhani Bai, “but we know what the consequences of such actions will be. They will cause the land to dry and our water to recede.” Gradually, Forest Department management caused changes in how forest resources are managed and how communities relate to each other and to the environment. In the village hamlet of Verafalli, home to sixty-five families, there is little land available for any scattered sowing, and neighboring forests are out of bounds. Forest Department guards and rangers confiscate any tools and penalize anyone found to be grazing their animals in the forests. In response to the kabja or capture of their traditional forests, women describe the different practices that have evolved to manage forests even within their own village vicinity. One section of Verafalli has continued to manage the forest as a commons, resisting the trend to fence off sections to individual households. Adapting practices from the past, the village has instead negotiated norms for the use and management of about five acres of forest. Women here have resisted attempts to divert these tracts to other uses and attempts by the Forest Department to incorporate this area to their control. While the state has yet to recognize Verafalli’s claim to the lands under the Forest Rights Act, the community under the women’s leadership has managed to ensure free access for cattle grazing and produce-collection for those who have been traditional users, or about seventy households. “The more that the state delays or neglects the implementation of the Forest Rights Act, especially the claims for community rights,” Sharmi Bai lamented, “the more likely it is that communities will move towards apportioning forest rights to individual families’ households.” Thus in Matafalli, another hamlet of the same village closer to the river, forest lands have been apportioned as separate parcels for each of the hamlet’s sixty-five families. This has resulted in endless wrangling and theft. “Even my own patch where I have planted fruit trees is not free from assault,” Sharmi Bai noted, showing us the area where the commons has now been fenced by individual households. Dhani and other women remember the severe famine in the 1960s when they survived on fruits, herbs and greens from the forests even though they were closed to the community. With no other options, most migrated to a nearby town to earn a wage. The wages allowed the community to survive, but it also allowed an influx of products from the market and traders eager to buy the local produce. As families grew and forests became depleted, each household now seeks to have at least one child in government service and others in jobs to provide for household needs. Hopes of the FRA being implemented effectively notwithstanding, their changed relationships with the forest have reduced their self-provisioning, on the one hand, and their dependency on wages have made them more dependent on markets. The traditional melas (local fairs) at the Khetia Bapasi – a local deity whose place of worship in the forest brought community men together to decide on community management affairs – are now reduced to a ritual. The jurisdiction of such gatherings is limited to discus­sions about the village and community lands because the Forest Department is now the dominant authority for managing forests and their use. While basic entitlements to the forests remain unaddressed, notwithstand­ing the mandate of the Forest Rights Act, the new District Commissioner who oversees the Abu Road region has proposed new schemes to strengthen livelihoods in the region, and to promote water harvesting and watershed management. Forest commoners are understandably skeptical. They have seen the ineffective, politically motivated behaviors of the state – and appreciate and struggle to retain the effective and sustainable processes of their own common­ing. The women of the forest commons have seen how their own knowledge, social collaboration, community ethic and leadership are likely to be a better means for protection of the forest commons over time than narrow scientific expertise and politically motivated policies that cater to the economic moguls. The women see strength in the provisions of the FRA, which recognizes a process of decentralized self-governance based on respect for their traditional rights: a process that will help them restore depleted commons and maintain those that exist through their traditional practices. This case study is based on the research conducted in collaboration with Jan Chetna Sansthan of Abu Road, Rajasthan, an organization dedicated to adivasi women’s rights. Support provided by Manju, Pushpa, Kailash, Laxman and Dinesh in the compilation of this case study is gratefully acknowledged. This case study is part of a larger study based on a grant received from Action Aid, which is also gratefully acknowledged. This text is from the book "Patterns of Commoning". For more articles visit our dossier. Under the PESA Act 1996, panchayats are mandated to “take care of the customs, religious practices and traditional management practices of community resources.” http://www.moef.nic. in/sites/default/files/jfm/jfm/html/strength.htm. The book Patterns of Commoning is a special series of essays which explores the inner dynamics of commoning - its ethics, social practices and worldview. In our dossier you can find a selection of nine texts to stimulate your appetite for more. More than sixty frontline activists, academics and project leaders from twenty countries explain how commoning is empowering people to challenge the deep pathologies of contemporary capitalism and invent powerful, participatory alternatives. A special series of essays explores the inner dynamics of commoning - its ethics, social practices and worldview - to explain why the building of new worlds starts from within. Venezuela: "We Are One Big Conversation"
Cecosesola is a network of about sixty cooperatives and grassroots organizations in Venezuela, with about 20,000 members. The cooperatives sell at weekly markets and provide community-backed loans, among many other services.